I like to write an end of year report for myself, to assess how I've done over the past twelve months [the freelancer's personal review, if you like]. Looking back at the equivalent post I wrote at the end of 2013 is remarkably downbeat. I was not enjoying writing, had little to no motivation, and was uncertain of the way forward. My goal for 2014 was simple: rediscover my writing mojo. Well, this year is all over bar the tinsel, so how did I get on? Computer Games: I've had an off/on relationship with this narrative medium over the years [mostly off]. But I finally got to work with Simon Meek at The Secret Experiment on two projects, after years of chatting and wanting to collaborate. Both projects were challenging and exciting - and that's all I can say about them. I'd like to do more games work, but again that's mostly out of my hands so it's an aim for 2015 rather than a goal. 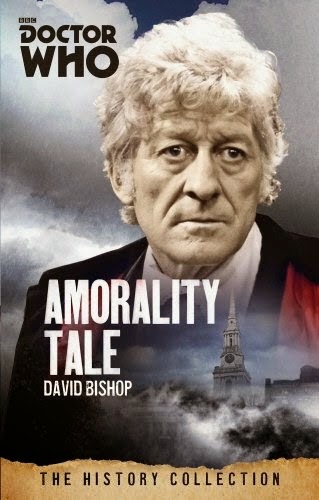 Books: I wrote a new introduction for Amorality Tale, an old Doctor Who novel of mine that's being reprinted by BBC Books early in 2015. It was fun revisiting the story, and reminded how much I used to enjoy writing prose fiction. I gave up novels for screenwriting in 2008, after hacking out a few too many potboilers to pay the bills. I can feel the itch for prose fiction slowly returning, but right now I'd say it's unlikely to be one of my goals for 2015. Radio: I adapted one of my old calling card TV scripts for the BBC Writer's Prize. [I won through more than 1200 entries to be one of the final 10 drama scripts in the 2013 contest.] My entry didn't progress this time, probably because I wasn't anywhere bold enough and failed to make the project fully inhabit the strengths of radio drama as a storytelling medium. But it kept me writing, so still served a purpose. Screenwriting: After a fallow period in 2013, I did indeed rediscover my screenwriting mojo. I've been writing a feature film off and on this year, and enjoying the process enormously. It's a romantic comedy, which is so far beyond my normal genre range as to beggar belief [people who know my work laugh when I tell them I'm writing a rom-com]. It's done on spec with no deadline, so finishing this is a definite goal for 2015. My other screenwriting project of the year was TEALEAF, the pilot script for a returning pre-teen drama series. I've had the idea for it since 2009 but the BBC writersroom had a call for children's TV scripts this summer [called Script Room 7 - SR7 for short] and that provided a deadline to focus my energies and efforts. I got a polished first draft done in time for submission, sent it in and tried to forget all about TEALEAF - but I couldn't. Those characters and their world really chimed with me, so I kept working on the script. I sought out feedback from writers, a writer/director and a showrunner/script editor I know. They all had great, challenging notes that forced to me dig deeper [thanks Debbie, Chris, Adrian & Rachel]. The result is a fourth draft script and pitch document that's out being read by various independent production companies. It's an exciting time. Realistically, the chances of TEALEAF going into production are extremely slim, but I'm still proud of the work. Even if TEALEAF never finds a wider audience, the script still serves as a calling card for writing opportunities on CBBC audience shows. TEALEAF was inspired by series like Debbie Moon's Wolfblood, thematically rich dramas full of heart and smarts. Getting to write for such series is a definite aim for 2015. You'd never know I used to be a journalist because I have absolutely buried the lead here. My biggest success in 2014 came thanks to TEALEAF. My entry to SR7 got through to the final 3% from 600+ entries. Better still, it secured a meeting with the CBBC development team in 2015. Obviously that meeting comes with no guarantees but I'm already preparing for it. Working up two new series ideas for CBBC is a key 2015 goal. This year was about rediscovering my mojo, and it was a success. I'm enjoying writing much more than last year, eager to crack on with current and fresh projects. My biggest challenge is finding time to do those projects justice, but I'm not letting a busy schedule be an easy excuse anymore. I may not have had anything new on TV in 2014, but it still feels like a turning point. Coming soon: my three main writing goals for 2015. Onwards!